Here's a quick walkthrough and strategy guide for the role playing game League of Angels - Fire Raiders. 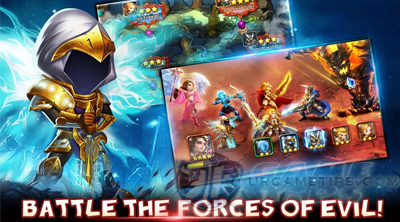 Collect and summon heroes and angels to join your team. Upgrade their gears, skills to make them a formidable allies and help you dominate the Arena, Trials and more! - Follow and complete them while doing Adventure campaigns to give you ideas on what to do next. No need to rush, just reach what you can with your current team, if you can't advance, stop and refer to the "Once You Hit A Wall" section below. - A must "to do" tasks to level up your League Lvl. - The Quests feature will unlock at Lvl 10. - Complete what you can to get additional rewards. - Lunch Time: Check the given time and claim your Free Stamina during that time. Note: Missed rewards can't be reclaimed! - Gold Exchange: Do this only once a day to get the League Lvl EXP from the "Gold Exchange" Daily Quest. If you're lucky, you can get criticals that will multiply the value of the Gold you'll receive. - Sign-in everyday to get awesome rewards and gifts, especially the free Hero of the month. - Most events are for VIP only or Diamond users, but just check and complete all available free events if you are a "Free to Play" user. - Do not waste your Gold here, just use your "free chances - Crystals" to get extra items, spend your Gold into more useful options like upgrading skills. - One exception here though is to buy only to complete the "Draw Card" Daily Quest, but as much as possible, try to complete using the "free chances". - Once you have too many excess Gold mid to late game, the "Draw 10" option isn't a bad idea. This will give you some free heroes, gears including purple, Hero Soul Stones and more. Make sure you have enough Gold for upgrading skills though. - Just get the free chance after the cool-down timer (about 2 Days). Your first one has a high chance to draw a Hero, add and level this Hero up for your main team early game. - If you are a heavy or casual Diamond user, buy the "Draw 10" option to get 1 guaranteed Hero as a bonus. For Free 2 Play gamers, earn your extra Diamonds for this one once, then use your Diamonds for better options like buying more Stamina. Continue the tutorial until you get all starting 5 Heroes and 1 Angel. Just reach what you can with your current team. - Getting 3 Stars will unlock the Blitz option (unlocks at League Lvl 8). - Blitz Battles: No hero EXP, but you'll get EXP items that you can use to any Hero you choose. - League Lvl is the most important aspect in the game. It will unlock new features and strengthen your Heroes by lifting up their Hero Lvl and Skill Lvl caps. It also increases your Max Stamina for more gameplay time. - Get League EXP from battles and quest completion rewards. -The max level of heroes is limited by your League's level. You can tap on the top left corner of your main menu's avatar to check. - If one of your Heroes is maxed, you might want to switch that Hero to one of your lower leveled Heroes to level him/her up too, especially when doing replays at lower stages or during training. To effectively level up a new front line Hero. use a healer or just feed EXP potions. - Don't underestimate your starting 5 Heroes, most of them are still useful early to late game, for PvP, PvE or both. I recommend keeping Rose Knight and Pyrona. Atalanta and Nether Knight are ok but Green Archer will probably get replaced by better heroes as you go on. - Don't just focus on 5 Heroes, you also need a 2nd Team or more to help you out in the Trial Modes, so it's ok to level them up. Get all Heroes that you can, this way you can create teams that suits your gaming-style! - Ultimate Skills can be activated when the Energy bar is full. It is filled when your Heroes attacks, gets attacked, or if they will do last hit kills for +300 Rage bonus. - Note: Rage and Hp Regen only triggers between waves or battles. - I'm sure you are wondering if which heroes to promote more? I'll say all that you can, focus on your main 5 Heroes, then work on the next ones. - Green +: means a gear is available for the Hero to equip, or item is ready to craft. - None +: means there are no available gear for that Hero. Browse through the items' description and "how to get" section to learn where to farm them (tap on the items/compose materials). Probably, you might want to farm the items in stages you have unlocked first. - Promote your heroes to make them stronger ("will absorb stats from gears") and to unlock new tier of skills. - If you have extra Stamina and you don't know where to use them, I recommend that you farm any item or "materials for crafting" that can be used every promotion. - League Lvl 9: Elite Stages will be Unlocked. - Farm Hero Soul Stones to get more Heroes by completing a set of Soul Stones. - If you already have the Hero, Soul Stones will just be used as Upgrading Materials, farm them if you have extra Stamina to use. For now, focus first on getting more Heroes and upgrading your main Heroes' Lvl and Skills. - Upgrading Heroes will increase their Stats Growth Rates. Best done late game for your core Heroes, choose wisely! - Optional: While farming Soul Stones for new heroes, you can also farm some Soul Stones that will give quick upgrade to your 1 Star Heroes. - Note: Upgrading Stars early or late game will yield the same stats in the end. Growth Rates will recalculate all stats after adding a star. - boost Team or Hero Levels. - and to Promote Heroes by farming the items needed. - Even if you can't play much everyday, at least use your 1 chance per day. - Note: F2P gamers can only do these twice a day ("the second is optional though since it's worth 200 Diamonds! "), unless you are a VIP gamer. - Do this only once a day to get the League Lvl EXP from the "Gold Exchange" Daily Quest. If you're lucky, you can get criticals that will multiply the value of the Gold you'll receive. - Draw 1: Just get the "first time draw" to get the bonus hero. - Draw 10: Well, this is kinda hard for F2P gamers because the required Diamonds is somewhat high, it's better to spend them to Stamina and farm Soul Stones to get specific Heroes early on then just earn your excess Diamonds for this as you go on. Aim for the first draw to get a nice hero. - This is optional though. Unlocking more slots will let you train more heroes at the same time. Upgrading the slots is also optional, could be useful for you at later stages of the game where EXP is too slow. - A nice place to get various items. - Note: Only use Arena Points for purchasing Hero Soul Stones. - Fight teams with lower B.R. than yours to get a higher chance of winning. You can review your opponent's formation if you hold your tap on the player's avatar. - Select your 5 heroes in the hero selection screen, then drag the heroes to switch their positions. Yes, it is possible to put an Archer or Mage in the front line, and Warriors as your rear heroes. - The key is to form a team that works together. Mix, match, and experiment to find what suits your defensive and offensive playing style. Free Diamonds will be rewarded depending on the difference of your current rank to the next one. - If you can't win anymore, you an still purposely lose fights to complete the "Arena" Daily Quest. - Also check the time (9 PM) when they will finalize the rankings and send the Arena rewards. - Check the "Chart" to see what other players are using, observe and learn some Hero combinations and ideas here. - If you have extra Gold, buy some items here in-case you'll need the them for later use, especially EXP potions! - Never ever sell your EXP potions! Although it's tempting to sell them for Gold, especially early to mid game, I would still recommend that you keep them for later Lvls, for your core or other Heroes. - It let you train your heroes or angels. Heroes or Angels will get experiences according to the quality of each train slot. - You can buy extra train slot with diamonds. - You could upgrade the quality of train slot with color from white to green, blue, purple and orange. EXP potion will immediately bring experience to heroes/angels. - Heroes and angels in training process can still join battles. - A nice way to earn lots of Gold and various items as you increase your rank, plus, it doesn't require Stamina to play. - This is like a labyrinth mode, HP and Rage will carry on to the next battles and dead heroes will not revive until the server resets (5 AM). - I recommend you reserve some healers ("heroes and/or angels") here, then charge all of your heroes' Rage bars in the first few stages. Use your Heroes, Skills, and Stars wisely per stage! - TIP: If you are at a disadvantage, hit pause then quit to try other strategies you have in mind. - Angel Chests: Requires Diamonds, so don't if you are a F2P player. - If you earned so many points, you can buy some Purple Items too to help promote your core heroes to purple. - Another mode where you can get lots of Gold depending on your teams' total damage. Doesn't require Stamina to play. - Join a guild with a good number of active players to enjoy guild features. - Complete guild related Daily Quests, and only use your Guild points for Hero Soul Stones. - For Camps, try to deploy archers and mages, because warriors are common and will not get hired since they already have Rose Knight and Atalanta. Try to deploy non-starting 5 heroes too. - Deploy a Hero, if your guildmates hires your Hero, you'll get a decent amount of Gold! - It is most likely that your guildmates will hire Front line Heroes or Tanks, Support Heroes, and Heroes with nice stats and skills. - If the majority of your guildmates' League Lvl is around Lvl 30, you might want to deploy Heroes with around Lvl 30 too, this way, you'll get a high chance that your Heroes will be hired. - Recall Hero to claim Gold. - To hire a mercenary, go to one of the Trial Modes. Access the hero selection screen then select the Mercenary Tab. Open up a slot in your team then choose a nicely upgraded Hero for that Stage. - More Guild features will be unlocked once they add more updates, like Island Raids and more! - Hero enchant feature, a nice way to spend unused gears. - Front Heroes: Go for HP, then the other defensive stats. - Rear Heroes: Go for offensive stats first, then the other defensive stats. - A nice place to get item shards and fully crafted gears for your heroes! - Blitz Coupon: Go to the "Adventure Mode" then tap on the Blitz Coupon ("lower left corner") to blitz hero stages for free, with no cost of stamina or chance! In short, it is used to farm more Hero Soul Stones. - Using specific hero type will get stat bonuses ("Ace"), try to use 2 or 3 of them, hire from your guild if needed but make sure they are nicely upgraded. If you can't hire any good heroes, continue using your best team available. - Doesn't require Stamina to play. Congratulations! If you reached this point, then I hope you already know what you are doing. Gold, Stamina and Diamonds shouldn't be a problem, since you already know where and how to get them.